Talk Shows are 'too hot for TV?' ...not too hot for the Internet. How 'bout a web site just for Talk Shows? 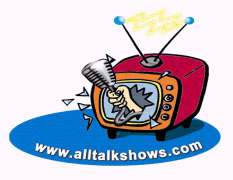 Introducing alltalkshows.com a new web portal devoted soley to talk shows. One community on the All Company site will be called "all talk shows," this will include the entire talk industry, including daytime, night time, cable, Sunday morning, radio, and Internet-based talk shows. From Oprah, to Sally, to Rosie, to Leno, to 6 Springer, to Limbaugh, to Meet the Press, it will all be covered here, delivering broad, diverse demographics to our advertisers. The site will be fully interactive. Soap Operas will always be hot... and so will the Internet. So why not a web site dealing with soaps? Introducing allsoapoperas.com a new web portal devoted solely to soap operas. Soap Operas reach millions of people every day, allsoapoperas.com will be there covering the industry from head to toe. The site will feature the latest news, exclusive interviews, gossip, today's happenings, chat, message boards, write your own story line, why I love soaps, email links to your soap operas, web site addresses, listings, ratings, viewer poll, and an exclusive Soap Opera Store. The site will be fully interactive. The All Company, Inc. © 2006 All Rights Reserved. through an authorized purchase agreement obtained from the Company and/or its agents.